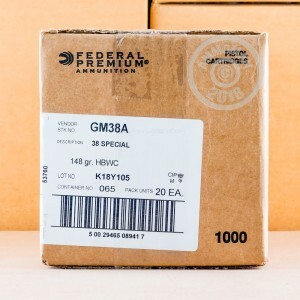 This 38 Special cartridge from Federal Premium’s Gold Medal line of ammunition sports a 148 grain projectile. 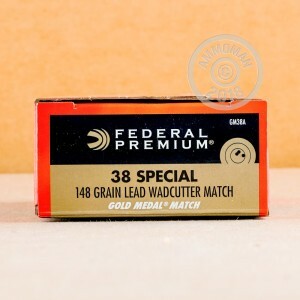 As a lead wadcutter this competition-grade match bullet is optimized for competitive target shooting, since the neat hole it will punch through a paper target will leave absolutely zero ambiguity when it comes time to score your shot. This round is great for casual shooting as well, as you’ll receive instant feedback on your accuracy. Accuracy is the big draw with this round, in fact -- with Gold Medal’s match-grade Boxer primer, consistent powder load, and premium brass casing made to exacting tolerances, you’ll enjoy shots that go exactly where you want to put them. 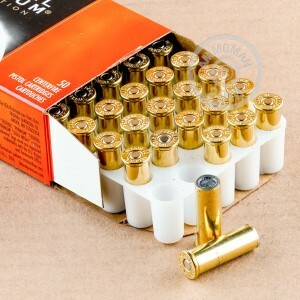 The brass casings are reloadable, and due to the match-grade specifications of the round, you can be assured that they will be among the best casings you can find for 38 Special handloads.